It’s true that there’s nowhere else like the NT. It’s a vast land of contrasting landscapes: wide, red and barren; lush, leafy and green; ancient, rocky and imposing. Throw in a host of eclectic towns, a cosmopolitan city, sacred lands, and unique characters, and you have an extraordinary melting pot of culture and traditions. So it’s no wonder that when it comes to celebrations, the NT’s calendar of events is far from ordinary. Here, we’ve picked a handful of events that you’re unlikely to experience anywhere else. Picture it. Head-banging, soul-stroking rock in the most incredible of places. BLACKEN Festival is one of the most sought-out events in the national heavy metal calendar. Visitors can catch a line-up that includes the likes of Southeast Desert Metal, Vicious Circle and Shatter Brain if you’re so inclined. The colourful camping festival attracts more than 30 bands who play across two stages. However, if you’re more interested in tugging on the heart strings over the guitar strings, you’ll want to head over to The Alice Spring Desert Park, just 10 minutes from the city, where you’ll be in awe of the inhabitants of one of the world’s largest desert nocturnal houses. Bilbies and malas live on the property, and a visit will mean you get the chance to navigate through the night with them. Bliss. Now in its eighth year, the Uluru Camel Cup is one race not to be missed. Kicking off on Friday evening, the lively Calcutta gives you the chance to place your bets on your favourite camel. Come Saturday, it’s time to watch the dust fly. After qualifying races comes the nail-biting Dash for Cash, Plate Race and then finally – the main event – the Uluru Camel Cup. When the racing is said and done you can immerse yourself in some outback entertainment, including a whip cracking display, Fashions on the Field, a reptile show and helicopter flights, before kicking up your heels for a night of dancing on the red dirt dance floor. Building tinnies out of tinnies: how Aussie is that? Originally an attempt to clean up the rubbish around Darwin, the annual Beer Can Regatta is now a hugely popular event where contestants build boats out of beer cans, plastic bottles and milk cartons to race (or simply try to stay afloat) at Mindil Beach. With 10 ‘Can-mandments’ including ‘thou shalt float by cans alone’ and ‘thou shalt not drown’, it’s a comical spectacle of weird and wonderful boats battling the elements. The event also includes sandcastle competitions, kayaking races, thong-throwing comps, tug-o-war and other family-friendly entertainment. If there’s one thing the Northern Territory isn’t short of, it’s wide open spaces. One in particular has captured massive national attention for hosting one of the world’s most ‘out there’ and as some have described – ‘beautiful’ – festivals in the world. In its 10th year, Wide Open Space Festival at Ross River Resort in the ancient East MacDonnell Ranges is a three-day celebration of music, art and desert culture. With a big emphasis on music, visitors of Wide Open Space will enjoy live music, electronic producers, hip hop crews, superstar DJs and acoustic acts, covering a myriad of genres. If you’re wondering what warrants the ‘out there’ description this festival receives, it’s most probably down to the yodelling quartets, desert reggae – or perhaps the body percussion or roving burlesque performances. Australia’s own rock sons, Regurgitator, also often make an appearance. Aboriginal artistic director Gary Lang’s dream of a dedicated festival showcasing works from Aboriginal and Torres Strait Islander artists comes to life each year with the Garrmalang Festival. The festival celebrates Aboriginal and Torres Strait Islander artists, dancers, musicians and performers from remote communities in the Northern Territory. Your adventure begins at the Darwin Entertainment Centre on the Garrmalang land of the local Larrakia people, where you can spend an incredible few days sharing stages, stories and songs. Situated on Murumburr Umbukarla Country and hosted by Kakadu Billabong Safari Camp, Mayali Mulil Festival enables you to connect with Aboriginal culture over a three-day celebration of tradition with song and dance. Mayali Mulil Festival works to support and promote local and regional Aboriginal enterprises, and there are more than 10 cultural activities and workshops in the calendar, including bushwalks and talks and spear-throwing competitions. With a host of food and drink stalls, plus camping and safari-style accommodation, this is one deep dive into Aboriginal culture you don’t want to miss. Born out of the destruction and devastation of Cyclone Tracy in 1974, the original purpose of the Darwin Festival was to celebrate the revival and resilience of the tropical city. The festival now focuses on community arts and culture, celebrating music, theatre, visual art, dance, cabaret and food. Held over 18 days in August, this year’s key event includes performances by comedians Ross Noble and Urzila Carlson; Limbo, a fusion of cabaret, circus and acrobatics; and Buried Country, a showcase of moving Aboriginal music. Just when you thought the MacDonnell Ranges couldn’t get any more breathtaking, in comes Parrtjima. The purpose of this dazzling festival is to encourage all to gain a deeper respect for Arrernte country through Aboriginal art and culture (the festival’s name means to shine light on and to understand a subject in the Arrernte group of languages). The large-scale outdoor light exhibition is a fusion of ancient art traditions and modern technology. With the illumination of the MacDonnell Ranges as a backdrop, Alice Springs Desert Park becomes an outdoor gallery whereby artists across the central desert region can showcase works of all mediums through light installations. There is also a busy programme of music, workshops and storytelling throughout the festival. 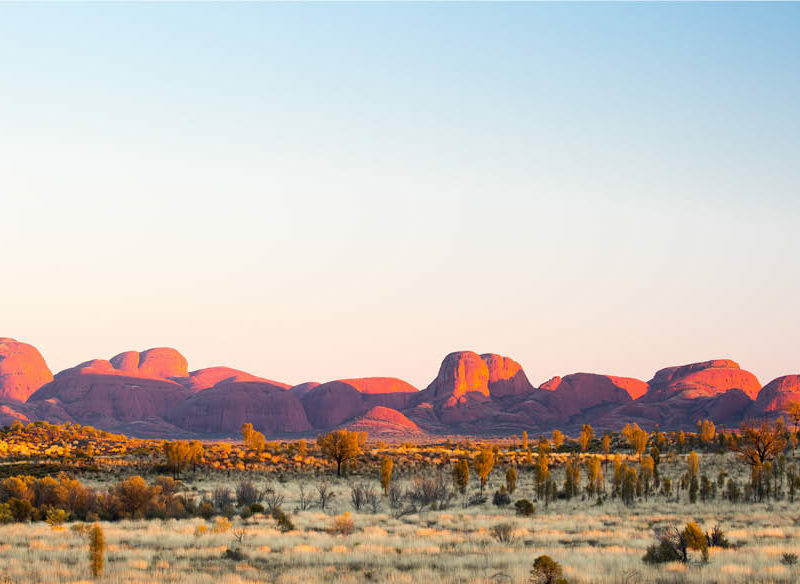 Celebrating the very essence of the Red Centre – its rich, arid landscape – Alice Spring’s Desert Festival is an initiative of Red Hot Arts Central Australia. The festival is all about celebrating local artists from the NT in visual arts, music, film and more. There will be live art, workshops and performances Alice-wide. Over 10 melodious days, the Desert Song Festival brings together the musical traditions of India, Africa, the Americas and Central Australia and showcases the cultural diversity of Central Australia, its land and people. With the majestic landscape of Alice Springs as a stage, performances are held at unique venues including Ormiston Gorge, Honeymoon Gap, and Stuart Town Gaol. A spiritual awakening at the country’s spiritual heart, the Desert Dreaming Yoga Retreat is an exclusive, once-in-a-lifetime event that encourages a connection with nature through yoga, music, dance and meditation. 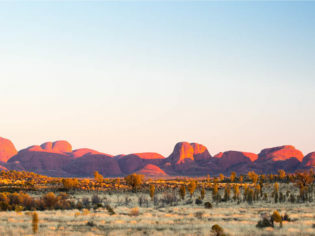 Held at Ayers Rock Resort and in Uluru-Kata Tjuta National Park, the retreat includes activities to quieten the mind and open the heart, such as yoga and spiritual awareness classes at Uluru and Kata Tjuta, a dot-painting workshop, and a pampering session at Red Ochre Spa. Nutritious meals and contemporary bush tucker are also included, as well as a unique dining experience under desert stars. Timeless traditions and modern practices collide at this truly special foodie festival dedicated to Aboriginal cooking with bush foods. Set in the ultimate ‘pantry’ of World Heritage-listed Kakadu National Park – a stunning landscape abundant with native ingredients, such as the Kakadu Plum, barramundi and bush berries – the 10-day Taste of Kakadu festival is a veritable feast of activities. The schedule includes pop-up dining experiences, foraging walks with traditional owners, cooking masterclasses, traditional ground oven feasts, and more.